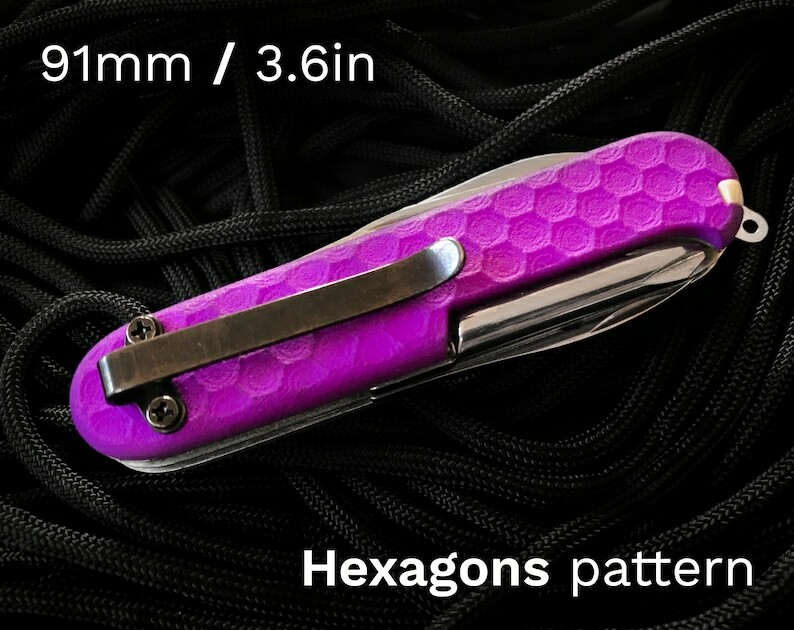 Custom replacement scales for 91mm / 3.6in Victorinox swiss army knives with a HEXAGONS pattern. Features a removable deep-carry clip to keep your knife extra secure in your pocket. Scales are made of tough, laser-sintered nylon that feels great to hold and provides excellent grip. Available in a wide range of durable colors. Scales snap into place with firm pressure, just like the originals -- no glue required. ▸ Plain has no corkscrew/phillips screwdriver notch and no pen slot. ▸ Corkscrew Only features a notch for knives that have a corkscrew or phillips screwdriver, but no pen slot. ▸ Pen Only features a slot for a removable pen (not included), but no corkscrew/phillips screwdriver notch. ▸ Corkscrew & Pen features both a slot for a removable pen and a notch to accommodate a corkscrew/phillips screwdriver. All options include the removable pocket clip. PLEASE NOTE: These scales are designed to fit a 91mm / 3.6in swiss army knife. This is the most common size available, but there are others. If you're unsure of which size you need, it's probably this one. Man, I love these Apple Watch charger wall mounts! I now have one for work and two for my chargers at home. They're brilliantly designed, and extremely handy. This is perhaps the slickest technical accessory I've seen in a long time. This mount holds your magnetic charger and lets you hang your Apple Watch securely while charging, which makes it easier to see the face and harder to knock off a bedside table. This thing rocks ! ! Great novelty crafted well and just as described. Thumbs up! I will gladly do my best to accommodate customized orders. Just send me a message with your request and we can figure out the details. I have a 3D printer. Can I print your items myself? Feel free to print out my items as you like. But please, only print them for personal use. Don't sell my items.